An Entire Dairy Is Shut Down by State Authorities for Animal Cruelty! The Maine Animal Welfare Program recently seized 15 cows, shutting down a dairy farm here in Maine due to abusive conditions, including lack of adequate food and water. The thin and dehydrated survivors were immediately brought to our quarantine facility for medical treatment and expert care. Legal custody of the entire herd is already being transferred to Peace Ridge Sanctuary, meaning these cows are finally (and forever) safe from harm. This recently rescued herd includes: 10 female dairy cows (2 of whom are pregnant), 1 bull (soon-to-be a steer), and four young calves – ranging from about two-months to only two-weeks old. On dairy farms, calves are taken from their mothers soon after birth and it does our hearts good to know that these mothers and babies will never have to be separated, nor will they ever be neglected and starving again. We are thrilled to be able to provide these cows with a safe, loving home for the rest of their lives, but we can’t do it without YOUR HELP! Our veterinary costs are already mounting and feeding this many additional cows, particularly because so many require extra food as we work to get them back to healthy weights, is expensive! 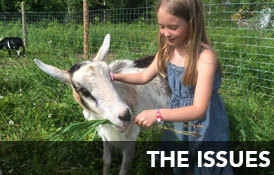 We are planning for an additional $36,000 in hay alone for this year and we are asking YOU, our rescue community to help us with this undertaking. Hay is being cut now, and we need to be able to purchase an additional nine thousand bales of hay by August, so we can rest assured that we have them covered for the year until the next hay crop comes in. Please sponsor one of our newest residents today! Sponsorship packages are available for individual cows or calves and mother/baby pairs and also available as one-time or monthly gifts. Click here to sponsor.